A little more about Sam: Nobody adequately prepared me for this guy. He is a hoot! I don't think I've laughed so much since I dyed Shucks hair pink (on purpose, I might add…cackle, cackle)! The funniest part is that, even when his jokes are not that funny, he laughs as if it is the funniest joke ever. Just watching him laugh at himself makes his jokes a lot funnier. When he showed up at our hotel, I wondered if the Mafia was in town when I saw his entourage. We started off the day really well today (no more back city street tours). We had the best cabbie! He was first of all very cute, in an "I-want-to-adopt-him-for-a-son" kind of way. He had a really happy heart, sort of open and innocent (I could tell all of this even though he didn't speak English). On the way to the orphanage, he showed us his cross necklace and sounded like he was trying to say he is "Hindu Christian." So later Reji explained (our assigned tour guide and Hopegivers Pastor) that he has an aunt figure in his life who has been telling him about Jesus and he said he has a "burning in his heart to learn more." So he is not officially a believer in Jesus yet, but he's definitely interested in learning more. We spent a great day with him and he was a lot of fun and very laid back. Later, he gave us his personal phone number and asked us if we needed a driver to call him and he would take us around. So Sam and the other pastors said they would use him for a driver in the future because he did such a good job and had such a good attitude. Also, later, Reji gave him a Bible (in his native Hindi language) and talked to him some more about Jesus. He was very open and asked if he could start coming to the orphanage church services to learn more!! It was so cool. Then, tonight on the way back to the hotel, he communicated to us that he is a singer. So we coaxed him to sing to us and he serenaded us all the way to the hotel in a typical Hindi songs. It was great. I can only bet that very few tourists get this kind of treament! We went to many sites today, some ancient structures and some more modern. I think one of the coolest was a Bahai Temple (Bahai is a religion) called the "Lotus Temple." It is an architectural wonder and is in the shape of a ginormous lotus flower surrounded by blue pools that make it look like it is floating from the aerial view. The grounds around it are beautifully landscaped on many acres, with flowers and trees perfectly manicured. We encountered it at sunset when it was bathed in a soft pink glow. Anyone from any religion can enter the temple and sit in one of the hundreds of orderly chairs for a time of prayer, but there is no talking, no photographs (oops), and no shoes worn in the temple. It was an awesome experience because the temple is massive inside with a dome. Of course, you know me—ever the opportunist—I just had to get a picture of the inside dome. All you could hear in the room full of people was the jingle of ankle bracelets worn by the Hindu women and a few babies chattering. The reverent atmosphere is unexplainable. The next few days are a Hindu holy week for the festival of color. We were supposed to go to the festival tonight but we couldn't find out where it was going to be held. It could be a good thing as Sam said we had to wear old clothes because we were likely to get paint and water all over us. Anyhow, all day we have seen the Hindu women dressed in bright glitzy colorful traditional sari's and Punjabis for their holy day—they look so sparkly and beautiful! 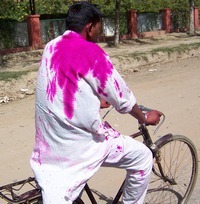 And many of the men put some kind of colored dye, paint, or chalk all over themselves for the event. I got a couple pictures of pink/purple faced men. I tried to get a picture of a green faced dog, but he tried to bite me as soon as I held my camera up. I guess he wasn't in the festival spirit. Speaking of which, on the way here, I told Maria that dogs hate me. She was like, "Yeah right! Dogs don't hate anybody—you're exaggerating!" Well, I will smugly report that since we got to India, I've had at least five dogs already come after me, growling and barking when we walked through the streets and slums. Seriously, they didn't bother anybody else with me! So tonight when Mr. Snarly-I-don't-want-my-picture-taken starts to lunge at me, and all I can think about is, "I didn't get the rabies shot…please don't bite me!" Today we ate lunch with Sam and his entourage at a nice downtown restaurant that has authentic South Indian food. I suppose down in South India they search out places to eat North Indian food. Kind of like how we Americans eat Taco Bell while the Mexicans eat McDonalds. The food was great, but at every meal, it is fried something or super hot something. Thankfully, Sam picked things for us that were not too hot. We hung out at the orphanage some more today and it will be all I can do not to bring a few of those kids home with me. I have never seen cuter kids (except my own, of course). There aren't words to describe just how cute, with their big brown eyes, huge white smiles, and black wavy hair. And they are so loving…they love hugs and pictures. They call us Auntie Julie and Auntie Maria. That is a cultural thing for adults in their lives. One thing that I love that Indians all do, is this little head wag from side to side when they are saying yes. It is so endearing! At first I thought they were shaking their head no at me, so it was confusing. Also, they don't say "thank you" like Americans do, so at first you feel as if they don't like what you did for them or maybe that they are not grateful. But part of the reason they don't show gratitude is for cultural reasons in that, historically, only the lower castes (Hindus) would thank the upper castes. So you are considered sort of a charity case if you say thank you. Also, the word "no" is not part of their every day culture and is too harsh and maybe even angry. Say they offer food and you don't want any, you should just say "I've had enough," or "I'm too full." lower and middle classes still practice arranged marriages, but the upper class apparently has more freedom to choose (more westernized). I have seen some benefits of arranged marriages among the Christian orphans here (I think there are more problems among non-believers). First of all, it is a law that girls in India are not allowed to marry until they are 21. Coupled with arranged marriage mentality, young girls (and guys) are free to just be kids and grow up without the complications of relationship pressures and problems. Also, when young people are arranged to marry, you remove many of the wrong reasons why American young people get married—lust, pregnancy, infatuation, emotional neediness, illusions, etc… The people here get married based on commitment, serving each other, and a decision to love. There is hardly any divorce in India. Among the non-believers, however, there is a lot of abuse and alcoholism. This is probably more true of the middle and lower castes. We still haven't hit any cows and I finally convinced Maria not to wear her "Eat more beef" t-shirt (joking). But tonight I had mutton at the orphanage and it was very good! Well, that's all for now. We learned today that we are leaving Monday morning for Kota to see the work being done there. Pray for us—I don't know if we can take Sam for two whole days in the car (those were his words). 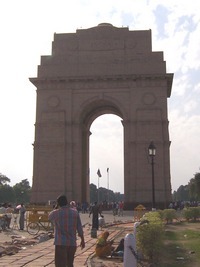 I think that is doesn't usually take so long but he is going to show us the sights on the way, including the Taj Mahal. Maybe even the Hindu Rat Temple in Jaipur. best & cheap scooters, before you buy must look in ! Get Exclusive Coupon Deals Coupons or Coupon codes or Discount Coupons to save money. Hi my family member! I want to say that this post is amazing, nice written and include almost all vital infos. I’d like to see more posts like this . I expected a lot from Russia Oh well, there is always a next time!